The South African group is worth $28 bln less than its stake in the Chinese gaming giant. Naspers boss Bob van Dijk rules out a spinoff, but that would be the best fix. Unfortunately for would-be activists, supervoting shares make it hard for outsiders to apply pressure. 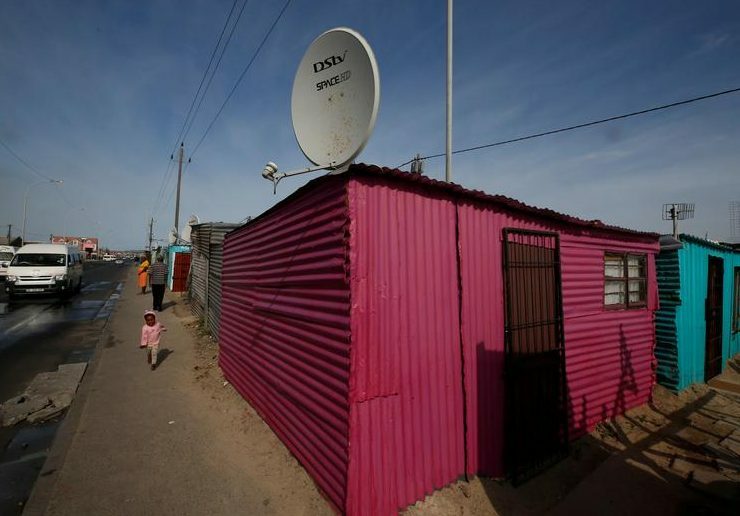 A satellite dish connecting residents to South Africa's DSTV television network, owned by telecommunications giant Naspers, adorns a shack in Khayelitsha township, Cape Town, May 25, 2017. Naspers, a South African media and technology company, said on June 26 it does not plan to spin off its roughly 33 percent stake in Chinese web group Tencent. Investors have urged the company to find ways to narrow the widening discount between Naspers’ market value and that of its stake in Tencent. In an interview with Reuters, Chief Executive Bob van Dijk said: “We’re working very hard to build our e-commerce businesses and I'm confident that the discount will narrow over time as those businesses get closer and closer to profitability." A shareholder urged Naspers to consider a spinoff, among other things, in a letter dated June 15. As of June 30, Nasper's market capitalisation was $86 billion, roughly one-third lower than the value of its Tencent stake. In 2001, Naspers invested $33 million in Hong Kong-listed Tencent. The latter is now China's most valuable company.